The powerful, high performance 2015 Mercedes Benz C300 Sedan offers world-class elegance and style, at a list price beginning at only $38,400. It differs from competitors by offering the highly esteemed Mercedes Benz brand name. For years, the manufacturer has enjoyed an international reputation for producing very high quality automobiles, backed by a strong service presence. 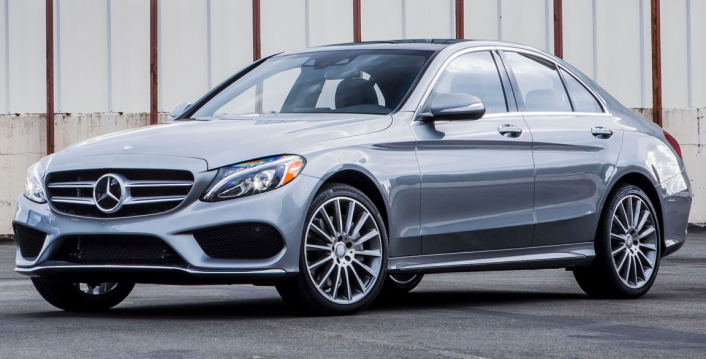 There is nothing standard about the standard 2015 C300 Class Sedan possess the sleek, fashionable lines and well-polished, metallic frame of an upscale vehicle. Buyers can select optional design modifications in two additional external decors: Sports Styling or AMG Body Styling. The interior displays aluminum glossy black trim, with a wood-paneled console and a padded black leather-enclosed steering wheel. The 2.0L Turbo Direct Injection 4-cylinder engine furnishes a horsepower of 214, significant enough to accelerate rapidly on short notice. The vehicle boasts an fuel-efficient mileage, also. In city traffic it obtains 25 miles per gallon, and on highways this figure rises to 34 mpg. With an aluminum and steel body engineered for strength, this luxury sedan permits the driver to place some functions under the vehicle’s control. For instance, the seven-level automatic transmission allows manually controlled acceleration changes through a shift paddle, yet also demonstrates cruise control capacities. The windshield wiper system automatically adjusts its pace to keep the windshield clear during lighter or heavier precipitation. The finely honed agility-control engineering system even regulates individual shock absorbers to help occupants enjoy a smooth ride based on the driving surface. Mercedes Benz included a special program called ECO Start/Stop which will automatically turn off the engine during driving stops and then re-start it again when the driver removes a foot from the brake pedal. Owners can choose to utilize this gas-savings feature, or they can override it. The C300 Class uses a Smart Key, which enables the driver to start the vehicle using a push button. The key fob houses a valet key, enabling drivers to use a more traditional ignition mode also. Once the owner exits and locks the doors, any subsequent attempt to open the doors or truck without the key triggers a panic alarm that sets off the horn and causes the lights to flash in warning. This model possesses numerous safety features, including Collision-Prevention Assist, smart seat belts, and an automated system to assist braking at high speeds. Communications systems within the vehicle allow owners to summon help in the event of a breakdown or accident. The manufacturer supplies the Mercedes Benz “mbrace” device as a standard feature, but owners pay extra for its program packages. In the rear, the vehicle offers an abbreviated trunk, yet one which can remain secured with a valet key. Owners can obtain extra storage space by folding down the rear seats individually. The C300 Class furnishes two 7-inch screens and a standard Bluetooth system. Numerous options increase entertainment amenities. This sedan offers performance and agility. Its features will likely attract numerous buyers.